The implementation of Common Core State Standards (CCSS) represents the most grand curriculum experiment in educational history with the least amount of evidence to back it up. Even so, Common Core enthusiasts often ridicule detractors of cram-down curriculum reform and supporters of local educational autonomy by pointing out that the Standards are not federal in origin and that they are not driven by a national conspiracy to brainwash children with socialist ideas. 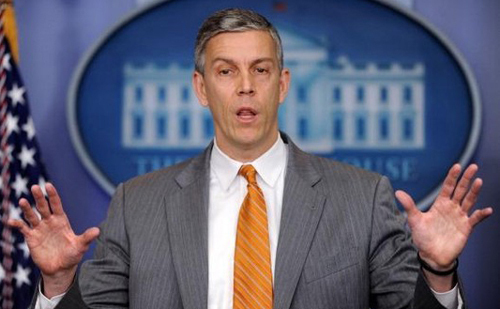 Arne Duncan's lies cannot hold back the tide of Opt Out during the 2014 testing season, or the critiques of Common Core.Even though CCSS are not federal standards per se, no one disputes the fact they would have never been endorsed by 45 states almost overnight, had the Obama Administration not incentivized their adoption with bonus points for states hoping to land part of the $4.3 billion in federal Race to the Top grants in 2010. Even though the Common Core carries the stamp of approval of the National Governors Association, they clearly represent corporate education reform goals. The Gates Foundation, alone, has provided more than $170 million for the creation and promotion of the Common Core since 2009. Following the election of President Obama in 2008, huge sums of tax-sheltered donations were funneled through Achieve, Inc. to consolidate earlier efforts at creating national standards. As a non-profit 501c dedicated to promoting increased accountability testing across all states, Achieve, Inc. is comprised of a handful of governors and a matched number of major corporate CEOs, all of whom remain aligned with agendas of the Business Roundtable and the American Legislative Exchange Council (ALEC). Achieve, in turn, contracted the writing of the standards to Student Achievement Partners, a consulting group comprised of lawyer, Susan Pimentel; former English major, David Coleman; and scientist, Jason Zimba. Having served as a tutor in a local high school while he was an undergraduate at Yale, David Coleman, the lead writer, has the most experience in K-12 education of the three. The Standards were written to Achieve�s specifications and demanded accelerated knowledge acquisition and tougher standards matched by the uber-rigorous standardized tests for all states. The Standards were billed as the best way to prepare students for college and careers, even though no research studies have been conducted and no empirical evidence exists to verify this untested hypothesis. In fact, a research report issued last week by the Brookings Institution found that states with CCSS-like standards have not scored as well as other states on the National Assessment for Educational Progress (NAEP), which has long been the accepted standard for measuring school achievement. Brookings found �states with standards most different from the CCSS . . . gained the most on NAEP (p. 29). Offering this dismal assessment of prospects for states adopting Common Core, the Brookings research estimates it will take 24 years for a noticeable improvement to unfold. And that improvement would add up to 7.62 NAEP scale score points, a gain in 24 years that falls far short of the 22 point gain that NAEP registered in its first 23 years [without Common Core] (p. 32). Implementation of the Common Core should be set aside until pilot studies can be conducted to ascertain the effectiveness of this scheme that may or may not bring higher scores, even though it will surely produce large numbers of children and schools labeled as failures (as occurred in New York last year). With standards so prescribed and tests so ready that they end up serving as the de facto curriculum, we need to ask independent educators and educational researchers their thoughts on. If Common Core is to be at all effective, even though it will seemingly take a quarter century to find out, then it seems appropriate to get this right to begin with. If career and college readiness are at stake, then at least we should take the time to gather evidence on whether Common Core can even improve test scores, which has come to serve as corporate education�s debased surrogate learning. After 12 years of �No Child Left Behind,� we know that ratcheting up high stakes testing does little to close achievement gaps, but it is a very effective tool for labeling the poorest schools as failures and turning them over for private management at public expense. Haven�t we had enough of the NCLB test and punish strategy that has chewed up a generation of our most vulnerable students and deposited them into corporate reform schools that aggravate the problems of segregation and low proficiency rates, rather than solving them? How can such a non-solution to educational inequality come to be labeled as �the civil rights issue of our generation,� as �reformers� repeatedly intone? Have we somehow replaced our moral compass with a technical set of directions to a destination we would never choose otherwise? If we stick with the other part of the federal blueprint that calls for five percent of the poorest, low-scoring schools to be turned over for charter conversion each year, the majority of public schools will have been privatized at public expense in less than 25 years. By then, we will surely have a clear answer as to whether CCSS has improved learning, and if it has not, then at least the primary mission of turning public education into a corporate revenue stream will not have been for naught.